Gene Nastri School Community School of the Arts was founded in 1984 by Carol Harkins and an intrepid board of volunteers. Dr. Maria DeRungs McKinney served 12 years as the first president. Originally limited to a two-week Summer Arts Workshop co-sponsored by Everett Parks and Recreation, the School began operating year-round in the fall of 1993. 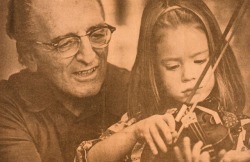 GNS is named for Everett violinist, Gene Nastri, who devoted over 60 years to producing some of the finest violinists to come from Washington State. In addition to teaching privately, Mr. Nastri taught 27 years in the Everett Public Schools String Program, and served 38 years as Concertmaster and founding member of the Everett Symphony Orchestra (now known as the Everett Philharmonic Orchestra). Setting high standards for discipline and artistic achievement, Mr. Nastri never lost his interest in the development of the "whole" child. Former public school students will often admit to not being the best violinists, but credit him with encouraging in them a lifelong appreciation for classical music. Many of Mr. Nastri's former students have enjoyed professional careers in orchestras throughout the United States, Canada, and Europe. "Teaching is an art and the teacher is an artist."